We are in the world with modern technologies which are growing in its way day by day. In addition to that, the general public’s also become more aware of the economic concerns and trying to move to an eco-friendly way of life. More than one million British families make use of wood stoves to warm their cockles during the winter season. But, the recent announcement says that the government has announced a plan to regulate wood burning stoves as part of its wide clean air strategy. In addition to that, the government will also ban the sale of wood stoves which don’t meet the environmental standards. The government says that all these rules are made in order to reduce the harmful emission of gases from the stoves which may lead to cut in pollution and save lives. So, what will be the solution to warm the houses in the winter season? The message says that there is a solution along with the permit of the government to burn the right wood on the right appliances. Here are some of the new guidelines for the wood stove owners under the new rules. With improved in quality and efficiency, the government has introduced a certification for the shoves that meet green standards. The latest environmental stoves will be available in stores soon which are labelled with ecodesign sticker which burns more cleanly without any emission of harmful gases to the environment. There are available with different type of environmental stoves with different efficiency ratings. According to the efficiency ratings and emission levels of the wood stoves, you can buy the environmental stove which suits the best for your area. If you are using your wood burning stoves more than 10 years, then it’s seriously advised to replace it. The latest environmental stove available in the market emits 90 per cent fewer emission than open fires and 80 per cent fewer than the wood stoves which are used more than 10 years. In addition to that, the newly designed stoves are more efficient than the existing ones and you will definitely get more heat for your money. 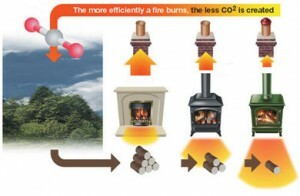 There are two ways to make your existing wood-burning stoves more environmentally friendly. Before that, you should ensure that your stoves installation is made according to the latest guidelines by the government. To make your wood stoves more environmentally friendly, it is advised to burn dry woods. By burning good and dry woods, it will produce more heat with less emission of smoke in the environment. There are some of the government approved stores which consist of ready to burn woods and it only consists of 20 per cent moisture. Try to get it to make your wood stoves environmentally friendly. There are about 7000 chimney fires are occurring in England every year due to unmaintained chimneys. So, it is advised to clean the soot out of chimneys which helps you to keep your house cleaner and fresher without smoke. It is advised to clean your chimney twice a year and compulsorily before the start of the heating season. It is recommended to clean your chimney twice a year to avoid unnecessary fire accidents. You can also take up the advice from the professional chimney sweeps before making your decision to buy the best Environmental Stove or to make your already owned wood stoves more environmentally friendly.